Experience the freedom of having a car and driver at your service. We’ll take you wherever you want to go. We’re here to help you get there: from shopping and entertainment to medical appointments and everyday errands—and, of course, airports, train stations and cruise ship ports. You can count on friendly FreedomCar drivers to take you where you want to go. Our senior transportation services have always been a core part of our company’s mission. We started out in 1991 serving the needs of families and we’ve since become a well-known, reliable transportation solution for seniors all across the Baltimore area. Whether you live in a neighborhood or in one of the local retirement communities, we can provide both individual and group shuttle services. 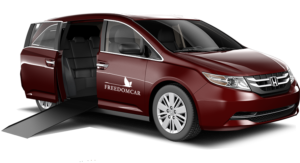 Always more reliable than a taxi, FreedomCar is also more comfortable and convenient than a bus service. So if you have to go down the road, across town or out of state—trips to New York are a customer favorite—call on FreedomCar for the hospitality and quality care you deserve. We’ve always thought personal service starts with real people! You can call us and speak to one of our representatives to set up your reservation. No phone trees or voicemails during business hours. And you can easily reach the owners who are on-site and available. We’ll set up your account and provide you with a clear estimate and reservation confirmation. There’s no tipping or in-car payments—our drivers are employees and don’t work for tips or commission. Once completed, your service will be charged to your account and you’ll receive an email receipt with all of the relevant details clearly itemized. You can rely on us to be on time and to pick you up a clean, comfortable vehicle. Our professional drivers will be neatly dressed in uniforms with monogrammed shirts and jackets. What’s more important is that they’re friendly, articulate and personable. Your experience is our top priority. Over the years, we’ve talked to many seniors about the cost of keeping and maintaining a car. You might be surprised to learn how the cost of owning a car compares to the cost of calling on FreedomCar when you need a ride. The numbers show how seniors can keep their independence with FreedomCar, at a lesser cost than keeping and maintaining their own cars! Download a copy of our cost-comparison worksheet so you can run the numbers yourself. It’s why we like to say we’re not just a car service, we’re a transportation solution. We’re proud to offer wheelchair accessible transportation with our state-of-the-art Honda Odyssey. It accommodates up to four passengers, including one wheelchair. Call us at (410) 321-5600 to learn more.